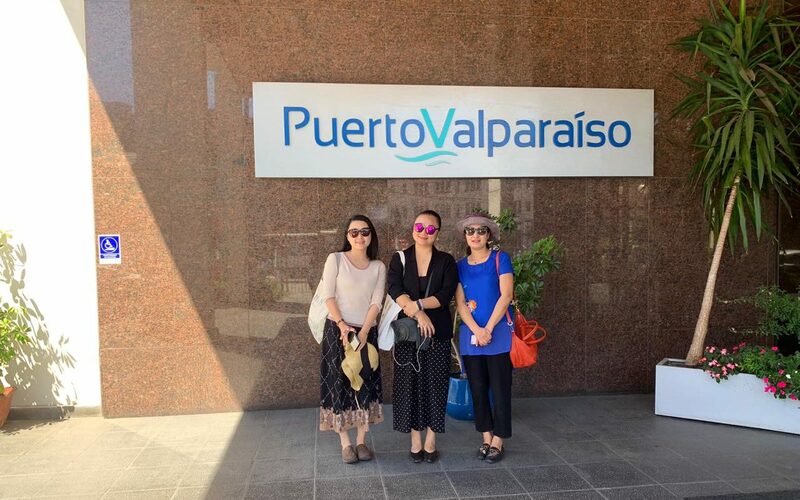 Through an invitation organized by ProChile, a group of Chinese journalists visited Chile for a week. They enjoyed a first-hand look at the main processes for products that Chile exports to China. According to figures provided by the Chilean Customs Service, during the period January through October 2018, trade with Asia represented 44 percent, with a variation of 20.3 percent, with regard to the same period in 2017. The data confirm China’s importance as a strategic partner for Chile and the relevance of the “Chile origin” to reach markets such as the Chinese. This scenario led ProChile, together with five agrifood sectoral brands, to organize the visit of journalists from three important news media, to introduce them to Chile and its food industry. During the visit, from December 10 through 14. sectoral brands ChilePork, Chile Olive Oil, Chile Prunes (dehydrated plums), Chilenut (dried fruit) and Fruits from Chile (Chilean fruit), showed the journalists the production processes for the main Chilean food exports to China. The geographical features that make Chile’s regions a unique place in South America were also explained. The visiting journalists work for important media in Beijing and Shanghai, with a readership of one million subscribers. The group was formed by: Yin Jun (Yolanda), Editor-in-Chief of Shanghai’s Restaurant Review, Yu Zhang, Assistant Director of Beijing’s China Food Newspaper, and Miao Qi, Executive Editor of Shanghai’s CBN Daily. Their first meeting was with ProChile to learn about the work being done with sectoral brands. 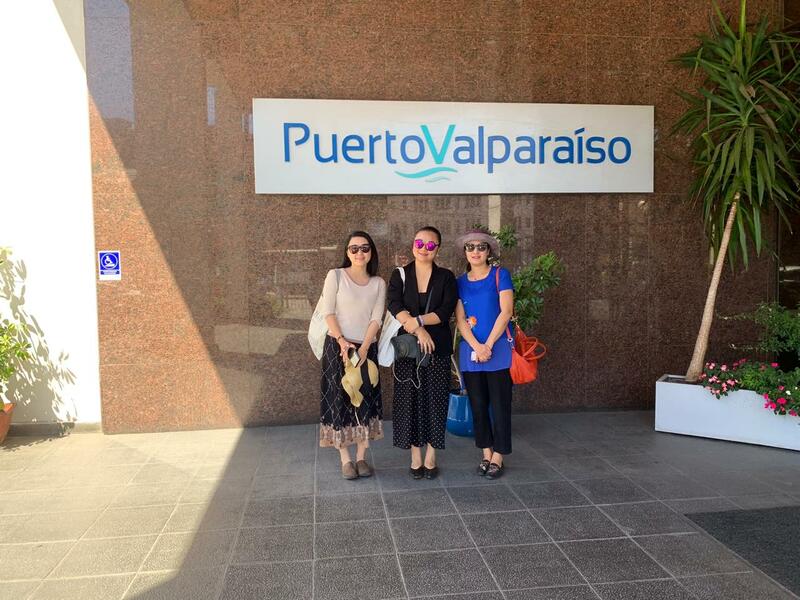 They then visited the Port of Valparaíso, the main logistics corridor for products exported to China. The guests said they left the country with valuable insight about production processes in situ. The visit changed the way they view products that arrive in China. They were also very pleased with Chile’s delicious cuisine, its fruit, the innovative pork industry and being able to appreciate different landscapes, visiting the mountains, the sea, and many other interesting things in Chile. The Chinese journalists learned about wine production during their visit to Viña Casas del Bosque in the Casablanca Valley. They then tasted the Colchagua Valley wines at Vinolia. Then they visited the Giddings blueberry production company in Placilla and the San Francisco Lo Garcés cherry processing plant in Molina. They also became acquainted with the olive-oil making process and tasted different olive oils at the Olisur and Alonso companies in Marchigue and Deleyda in Pumanque. They visited the SOFRUCO plant in Peumo to see how dehydrated plums are produced and the nut processing plant La Invernada in Paine. They ended their stay by viewing a Skyview presentation on pork production in Chile at the Rosario Plant, owned by Agrosuper. Another activity attended by representatives of different industries was led by Chilean Chef Rodrigo Barañao. In an interactive Cooking Show he prepared innovative recipes, showing the versatility of Chilean products, their quality and unmistakable flavor.